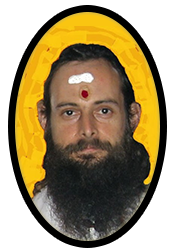 Gananathamritananda Swami is the Spiritual director of the Soma Matha spiritual center in Richmond Virginia, teaching about Yoga, mantra, meditation, Ayurveda and Vedic astrology. He has practiced Ayurveda with clients for about 15 years, offering lifestyle counseling, recommending herbs, and offering a range of Ayurvedic body work. He has authored and taught classes and certification courses in Ayurveda to Ayurvedic practitioners, Yoga teachers and lay people. He runs Siddhi Teas, a company which makes and sells Ayurvedic herbal teas, and maintains a living collection of nearly 200 tropical Ayurvedic herb plants.